Get ready to imagine, create and innovate at the Museum of Discovery's temporary Imaginate exhibit! 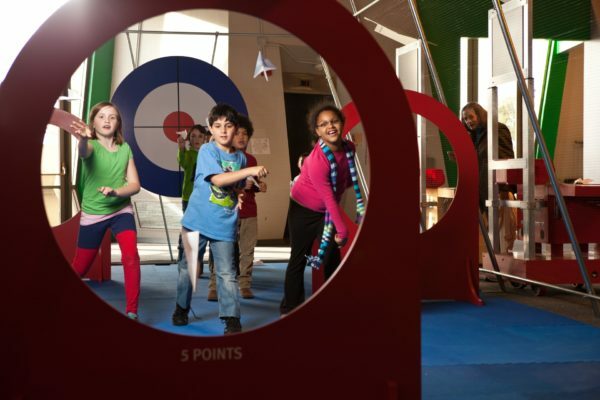 Get ready to imagine, create and innovate at the Museum of Discovery's new Imaginate exhibit! Imaginate aims to inspire innovation by incorporating multiple interactive activities and exploring four guiding themes: Dream Big; Expect the Unexpected; Collaborate or Compete; and Try, Try and Try Again. Dream Big features examples of big dreams as inspiration – such as flying in an airplane – and allows visitors to test their own paper airplane designs to see which flies the farthest. Expect the Unexpected provides a materials playground with a variety of materials – such as glass, metal and even plant material – in unique forms to explore and test. Collaborate or Compete features the sound lab, where visitors can jump and move as they collaborate to make music using giant light-up sound panels. Try, Try and Try Again invites participants to test the speed of surfaces ranging from Teflon to aluminum foil. Guests can test their innovation skills and creativity from April 6-Aug. 18. Entrance to Imaginate is included in regular admission: $10 for adults and $8 for kids 12 and younger. "This exhibit was immensely popular when we debuted it three years ago," Kelley Bass, museum CEO, said in a press release. "We are thrilled to get the opportunity to bring it back to thrill new audiences and let others reconnect with the many different elements that make this exhibit unique." For more information, visit the museum's website or call 501-396-7050.